Adriana Trigiani's bestselling novels are beloved by millions of readers around the world. Very Valentine, was an instant New York Timesbestseller and the first in a s­eries about the life of shoemaker Valentine Roncalli. In this sumptuous follow-up, a once-in-a-lifetime business opportunity takes Valentine from the winding streets of Greenwich Village to the sun-kissed cobblestones of Buenos Aires, where she finds a long-buried secret hidden deep within a family scandal. Once unearthed, the truth rocks the Roncallis, while Valentine is torn between a past love that nurtured her, and a new one that promises to sustain her. As I said in my review of the first novel in this trilogy, Very Valentine, that I messed up a bit. 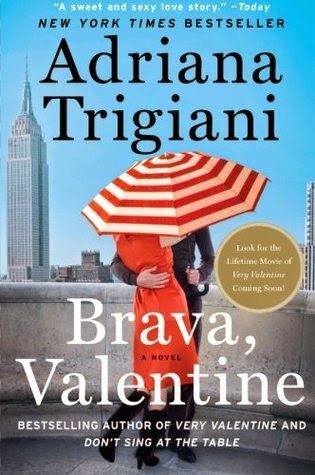 Not knowing that it was the third book in the trilogy, I read The Supreme Macaroni Company first, which means that I went into both Very Valentine and Brava, Valentine knowing how everything ends up. Because of this, I probably didn't experience this book as I should. So, read my thoughts with that in mind. Frankly, I love the character of Valentine. She's irreverent, flawed, and heartfelt. She doesn't feel like a nicely wrapped package, but rather someone you want to have as a friend. Her family is a kick--think My Big, Fat Greek Wedding, but in Italian-American form. Trigiani has become one of my favorite writers. Her prose is readable and lovely. I read this book in one day--which almost never happens for me. Even though I knew how everything would ultimately end up, it still kept my attention. If I had to find a flaw in this book it would be that it doesn't feel like a complete story as a stand-alone novel. You really need to read Very Valentine first and then follow it up with The Supreme Macaroni Company. In fact, I would suggest reading The Supreme Macaroni Company immediately upon finishing this book--there is no break in time between the ending of one book and the beginning of the next. I feel like a better review would be of the entire Valentine trilogy. While all three books are entertaining, they really need to be read together. Of course, I can't imagine anyone not wanting to finish the trilogy once they meet Valentine.